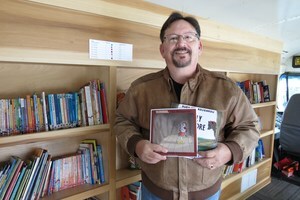 Otsego's own author Dan Reidmiller donated his first two published children's books to the Bulldogs Bookin' Bus and talked to kids about what it takes to be an author. The Bulldogs Bookin' Bus rolled into Dix Street as a part of March is Reading Month activities. As kids were visiting the bus, many of them checking it out for the first time since it was completed last summer, they were able to catch a special visitor. Dan Reidmiller, an Otsego resident and author stopped by to donate his first two children's books to the bus. His first book, "Rudy the Rougarou" is geared toward lower elementary readers and explores the scary swamps of Louisiana, although he assured the students the book really isn't scary. His second book, "Bully No More", also features Rudy, but is geared toward upper elementary students. He's currently finishing his first young adult novel geared for the teens which he hopes will be out within the next year. His grandchildren are his inspiration for writing. He would often read to them and they enjoyed that and encouraged him to write a book. He shared with the students that he loved writing because he loved reading and has actually been writing since he was about 16. It was just a few years, ago, though, that life settled down a bit and he got back to his writing and published his first book. His stories are set in Louisiana because that's where he and his wife have traveled to many times. He loves the atmosphere, culture and mystery of the area. He asked the students what they were writing and how many liked to write and draw. He encouraged them to keep writing and reading! Dan Reidmiller is holding a book signing event at Biggby in Plainwell on March 31st from 10am-2pm where $3 of each sale will go to Sylvia's Place. If you cannot make the event and are interested in the books, you can find his books on his page on Amazon.